Clare Hardin started as a Revels Kid in elementary school, and then later in high school. She has grown into an intern extraordinaire and current volunteer. The following is a guest post about her experience in the Washington Revels community, and why she thinks your kids would love to revels with us. 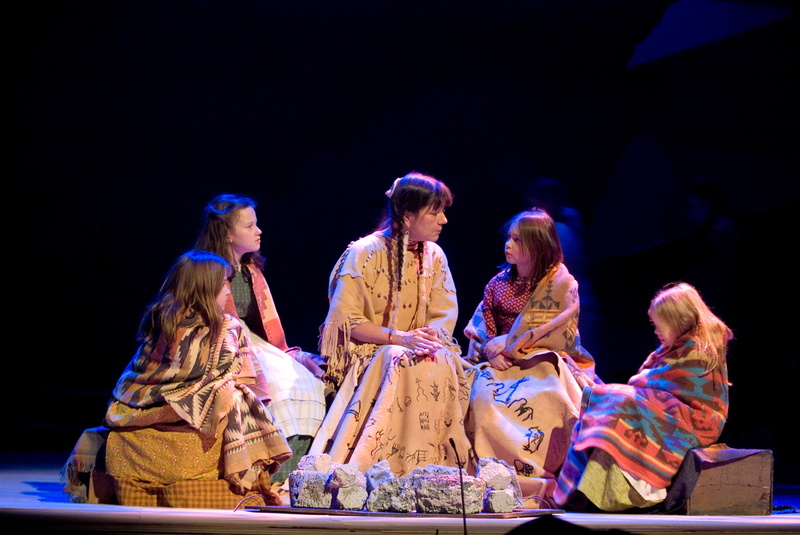 Dovie Thomason with Clare Hardin in the 2006 Christmas Revels. Hi, I’m Clare, and I’ve been a “reveler” since I was born. Here’s some of my story. 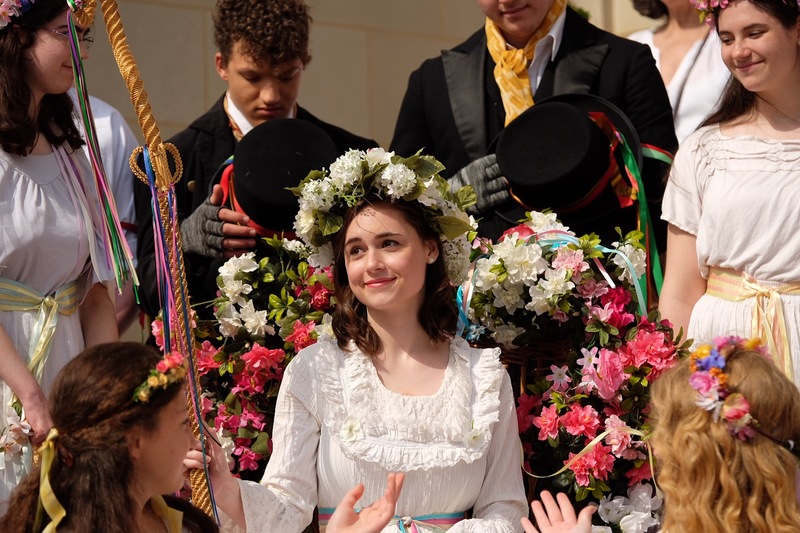 Clare as the May Queen in the 2014 May Revels at the Washington National Cathedral. All three Hardin sisters participated in May Revels as soon as we were old enough. My memories are happy ones of the cobbled path in front of the Washington National Cathedral, of dancing in hand-held circles, of cotton candy and repetitive verses of “The Rattlin’ Bog” that were somehow still fun after the 12th time. All three of us were also in the Children’s Chorus for several Christmas Revels productions — I performed in the 2006 and 2007 shows. 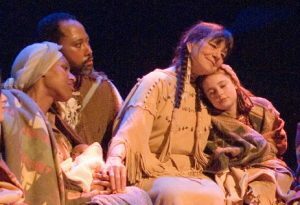 From left to right: Umoja Rufaro, Keith Moore, Dovie Thomason, and Clare Hardin in the 2006 Christmas Revels. 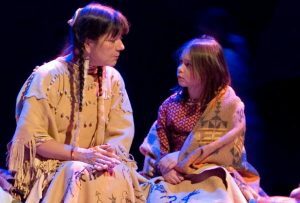 My first Christmas Revels was in 2006 — the theme was “Early American.” I remember sitting around a pretend fire near Native American storyteller we knew as Dovie (Apache storyteller Dovie Thomason), in awe and feeling lucky I was chosen to be in that particular scene. I remember being endlessly excited because I got the solo in “Morning Star,” and then nervous and embarrassed when during the first Lisner rehearsal, Music Director Betsy Fulford noticed that I was singing off-key. We were absolutely NOT allowed to eat in costume, except the clementines and goldfish in the kid’s Green Room. I got to tell my teachers that I was in a “big, important production” so I had to get my homework for “tech week” in advance. Staying up past 11pm was a big deal, and I got to do it every night for a show I loved. Those productions were fantastic, but the thing about Revels is that the shows themselves aren’t the most important part — it’s the people and the community that matters. That community — my second family — raised me. They taught me values of acceptance, togetherness, cultural awareness, teamwork, respect, and more. To be a Revels Kid is a privilege, and I don’t know who I’d be without it. Clare (on right) with Terry Winslow and Aryn Geier in the 2013 Balkan Christmas Revels. 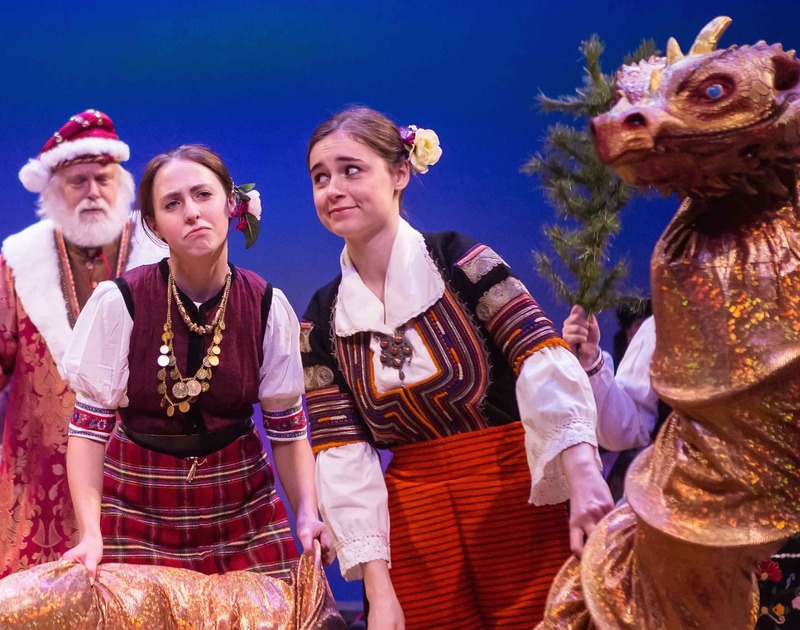 Fresher memories come from my four years as a teen in the Christmas Revels — they have been an integral part of my story. For a teenager dealing with the ups and downs of high school, Washington Revels was a refuge. It was a place where it didn’t matter if I had a bad day, if I didn’t feel like smiling. I would say that there is a sort of radical acceptance within the Washington Revels community, and you never have to ask for support — it was always there waiting for you. Though many people in my life outside the Washington Revels community knew about my Revels world, it still felt like a separate entity. It was my little bubble of kindness — where a 17-year old could laugh and sing alongside a 57-year old like they were best friends, where I learned to sing in 10 different languages, and more. Truly, there is no performing arts experience like it. There is no experience, in general, like it. If your child or teen gets a chance to be a Revels Kid, they should do it. Take part in an After-School Workshop. Audition as a child or teen for The Christmas Revels (each year during the weekend after Labor Day). Even if all you can do is come to a performance — do it! No matter who you are, you will be welcome. You will be loved. You will be valued. There is nothing more important than our community.